So I bet you’re surprised to hear this coming from a sleep consultant. But it’s true – your baby will never sleep through the night. In fact, all of us can expect to wake up multiple times in the night. This isn’t due to stress, caffeine, lack of exercise, or any other factors that commonly contribute to a bad night’s sleep. It’s a natural part of the human sleep cycle. We’re all familiar with the various stages of sleep from our own experience. I bet you’ve felt the difference between waking from a light sleep and a deep one. Simply put, when we fall asleep, we spend a little while in a light stage of sleep and gradually progress into a deeper one. We stay there for a little while and then reemerge into the lighter stage. When we do, there’s a good chance that we’ll wake up. That all sounds great, right? You fall asleep at eleven or so, hit that deep stage by midnight, hang out there for six hours or so. Then you start to come back to the surface around 6:00 or 7:00, gradually waking up refreshed and ready to face the day. Except the whole process only takes about an hour and a half for us as adults. From start to finish, going from light sleep to deep sleep and back again takes between 90 – 110 minutes. Luckily for us, the process repeats itself pretty easily. We may wake up for a minute or two and fall right back to sleep. Or we might not even really break the surface of sleep at all. This happens around five or six times a night. And so, we get a restful, restorative sleep in the night, and wake feeling refreshed, ready to face the day. What about our babies and toddlers sleeping through? Despite their increased need for sleep, infants have a much shorter sleep cycle than adults. An infant will go from light sleep to deep sleep and back again in an astounding 50 minutes, on average. So whoever coined the term, “Sleep like a baby” was talking rubbish! This is where the essential element of sleep support comes into play. 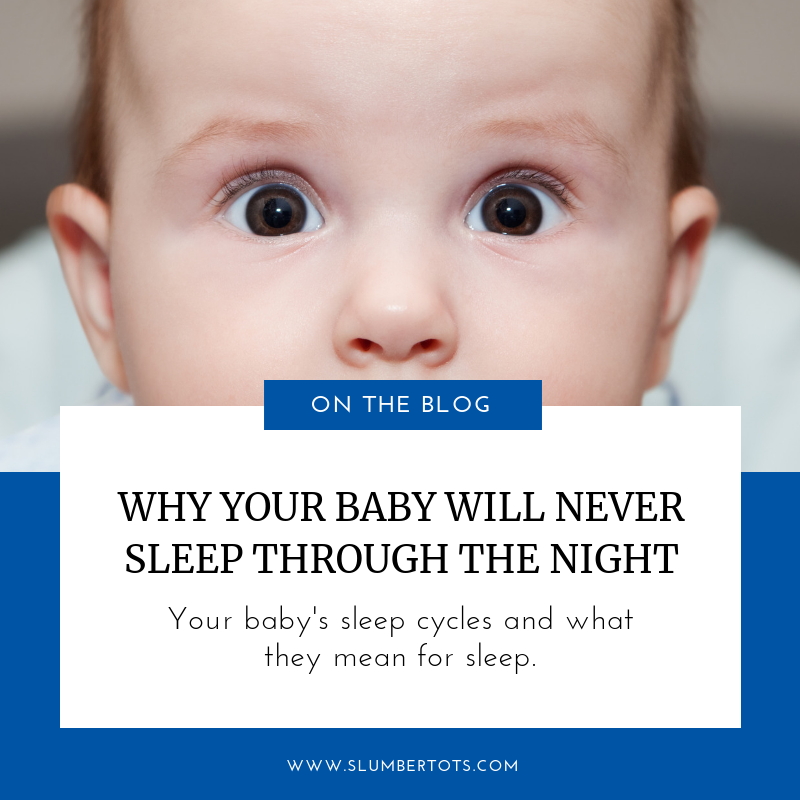 The sleep plans I develop for families don’t teach their child to go through the night, or spend more time in any one stage of the sleep cycle. What we do is teach baby to fall asleep independently initially, and settle themselves when they wake up. That’s it! That is the basis of how we teach a baby to sleep well. We help them to deal with these wake-ups as a non-event. Once they’ve learned the skills they need to self-settle, they’ll wake up after a sleep cycle. Then their brain will signal them to go back to sleep, and that’s exactly what they’ll do. Why is this so important for sleeping through the night? First of all, I want you to know that we’re not doing anything that actually influences or changes your baby’s natural sleep pattern. We’re not teaching them to go through the night, just giving them the skills to go back to sleep by themselves after they wake. Which, as you probably know by now, they’re going to do multiple times a night. And that’s absolutely right. Babies are supposed to wake up at night, just as we do as adults. All that we’ll be doing together is teaching your little one to stay calm and content when they do wake up, and giving them the ability to get back to sleep without any help from mummy, a dummy, or any other external source that might not be readily available in the middle of the night. So although your little one will wake up a number of times, they can learn the skills to get back to sleep on their own. And I’m sure you agree, that’s something we call all get behind. If you need any help getting things on track, then I’m always here to support you.